To help you transition quickly and easily to Lightspeed Retail, we'll help you to import the inventory, customers and vendors you already have. To import customer data, go to Importing customer data. To import vendor data, go to Importing vendor data. Prepare a spreadsheet for your inventory data based on the Lightspeed Retail requirements. Format your spreadsheet for easy import. If your file is not formatted based on our requirements we'll return it to you to modify. Submitting your spreadsheet to our Retail Imports team. NOTE: Data import can take 5 to 7 business days to complete. If we have to edit your data in any way, we will send the file back to you for your approval. If your file is not formatted correctly, it will delay your import. Create a backup of your original export file. The backup file is a precaution against any errors, and can also be used to verify your data. In your spreadsheet file, rename the column headings so that they match the Lightspeed Retail system fields. See Data fields for the inventory fields used in Lightspeed Retail. Review your spreadsheet data and fix any formatting or data errors as detailed in Data verification. 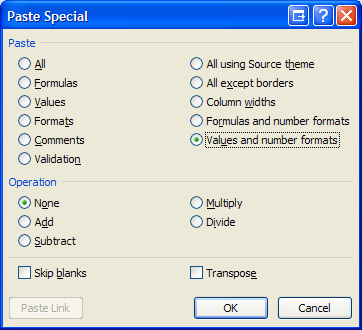 To avoid having to manually correct the data in your system, format your spreadsheet so that we can easily import it. Use these inventory field names to rename the inventory data headings in your spreadsheet. For example, if you have an inventory Item Name column, rename the column to Description. You can use this example of a properly formatted Excel inventory report as a guide. NOTE: Lightspeed Retail limits the import of item Categories to four levels: Category, Sub Category 1, Sub Category 2, Sub Category 3. Sub-categories beyond the third level are not imported. Also, you can re-order the columns as you wish. If any columns do not contain data other than the heading, delete the entire column. Must be a unique 11 or 12 digit or blank. No returns, line breaks or foreign characters. UPC (Universal Product Code) is a 12-digit barcode number. A 13-digit barcode number is an EAN number. EAN Item view > Details Tab > EAN field Must be a unique 13 digit number or blank. No return/line breaks or foreign characters. EAN (International Article Number) is a 13-digit barcode number. A 12-digit barcode number is a UPC number. Custom SKU Item view > Details Tab > Custom SKU field Unique text up to 255 characters long. No returns, line breaks or foreign characters. Used for internal shop use. Some shops use this field for their old POS barcodes or item numbers. Manufacturer SKU Item view > Details Tab > Manufacturer SKU field Unique text up to 255 characters long. No returns, line breaks or foreign characters. Manufacturer's SKU identification number for the item. Description Item view > Details Tab > Description field Unique text up to 255 characters long. No returns, line breaks or foreign characters. This field cannot be blank. Recommendations: Make each of your item descriptions unique so you can tell items apart by looking at their description. The color and size of the item will be added to the description if they are specified in the color and size column (Matrix items). MSRP Item view > Details Tab > MSRP field Currency format. Ex $1.99. This field can be left blank. Manufacturer suggested retail price. This is not what the customer is charged for the item. This field only displays on labels if selected in admin. Default Cost Item view > Details Tab > Default Cost field Currency format. Ex $1.99. This field can be left blank. Your cost from the vendor. Tax Item view > Details Tab > Taxable check box Can be yes, no or blank. If this item is marked as Yes, the item will be charged the default tax rate when added to the register. Price Item view > Details Tab > Price field Currency format, such as $1.99. This field can be left blank. Price you charge to the customer for the item. Tags Item view > Details Tab > Tags field Text up to 255 characters long or blank. No returns, line breaks or foreign characters. Multiple tags separated by a comma, such as "shirts, womens". Keywords or terms used to search for your product. This field can be searched by items tagged with or tagged without your search criteria. Category Item view > Details Tab > Category field Text up to 255 characters long or blank. No returns, line breaks or foreign characters. Category you want the item to be put in, such as Tires or Clothes. This field is searchable. Sub Category Item view > Details Tab > Sub Category field Text up to 255 characters long or blank. No returns, line breaks or foreign characters. Sub-category you want the item to be put in, such as Tires > Mountain or Clothes > Shorts. This field is searchable. Sub Category 2 Item view > Details Tab > Sub Category field Text up to 255 characters long or blank. No returns, line breaks or foreign characters. Sub-category you want the item to be put in, such as Clothes > Shorts > Men. This field is searchable. Sub Category 3 Item view > Details Tab > Sub Category field Text up to 255 characters long or blank. No returns, line breaks or foreign characters. Sub-category you want the item to be put in, such as Clothes > Shorts > Men. This field is searchable. Brand Item view > Details Tab > Brand field Text up to 255 characters long or blank. No returns, line breaks or foreign characters. Item brand, for example, Shimano. Vendor Item view > Details Tab > Vendor drop down list Text up to 255 characters long or blank. No returns, line breaks or foreign characters. Vendor who sold the item to the store. Vendor ID Item view > Details Tab > Vendor ID Text up to 255 characters long or blank. No returns, line breaks or foreign characters. The vendor's part number for that item. If vendor field is blank, vendor ID will not be imported. QOH Item view > Details Tab > Stock > In Stock Positive whole number. This field can be left blank. No negatives allowed. The quantity of the item you have on hand. Reorder Point Item view > Details Tab > Automatic Re-Ordering > Point Whole number and reorder level has to be specified. This field can be left blank. When you view a Reorder List report in admin, the item will show as needing to be reordered if your stock is at or below the number specified as the reorder point. Reorder Level Item view > Details Tab > Automatic Re-Ordering > Level Whole number and reorder point has to be specified. This field can be left blank. The level your store wants to be at when you reorder. If you have 3 items in stock, the reorder point is 5, and the reorder level is 10, the Reorder List report will show that you need to order 7 to get your inventory back to 10. Matrix Group: Name Inventory > Matrix > <Matrix Name> Text up to 255 characters long or blank if not in a matrix. No returns, line breaks or foreign characters. Name of the matrix. Matrix Group: Type Inventory > Matrix > <Matrix Name> > Setup > Matrix Type Color/Size, Size, Color, 3 Attributes, or blank. Type of matrix. Can be Color/Size, Size, Color, 3 Attributes, or blank. This field describes what type of matrix it is. If the items in your matrix (Matrix Group: Name) are only separated by size, type Size in this field. If your matrix is separated by color and size, type Color/Size in this field. Matrix Group: Color Inventory> Matrix > <Matrix Name> > Setup > Color/Size Values > Color Text up to 255 characters long or blank if not in a matrix. No returns, line breaks or foreign characters. Matrix items color. If the matrix (Matrix Group: Name) does not yet contain the color of this item, it will be created and the item will be added to the matrix. If the item is not part of a matrix, leave this field blank. Matrix Group: Size Inventory > Matrix > <Matrix Name> > Setup > Color/Size Values → Size Matrix items size. If the matrix (Matrix Group: Name) does not yet contain the size of this item, it will be created and the item will be added to the matrix. If the item is not part of a matrix, leave this field blank. NOTE: Items in a matrix will not use what you enter in the description column. They will be automatically generated based on the matrix group: name + matrix group: color + matrix group: size, for example, Company T-Shirt Red Small. If you do not want this result, do not import matrices. Edit special characters, such as ™☺↨♪♫♀♂¶▓© so that they display the correct data. Correct rows that extend into other columns. Change the Category to Number, set Decimal places to 0, and then click OK. Select the data you want to change, whether that's a row, column or the entire document. For the text you want to replace, type N/A. For Replace with, leave the field blank. I inserted another column, clicked the first cell (D2), and typed “=CONCATENATE(“. Then you can select the first cell you want to be displayed :::first. I clicked C2 then added the: ,”: “, (creates the separator “: “ between the first two cells that I want in this formula), then I clicked :::the cell that I wanted to be next (B2), added: ,” “, (creates the separator “ “ [I only wanted a space between the last two cells in the formula]), :::and then click the last cell (A2). You more than likely have more than one row, so if you want to apply this to all the rows, click the box and drag it to the bottom of the column, which gives you a list of concatenated results. If you click one of the cells, you will see that what’s in it is actually the =CONCATENATE function. To make the cells become “T-Shirt: Large, Red,” for example, copy the column and then paste special and select Values and number formats. Highlight all of the data in the spreadsheet. In the Find box, while pressing Alt, on the numeric pad type 0010. Don't type anything in the Replace box. Excel will trim the leading 0 from UPC numbers. To correct this, add "0" (a zero in apostrophes) to the beginning of a UPC number. Typically, UPCs are 12 digits long, so you could sort your spreadsheet by the PUCs and fix any that are 11 digits or fewer. This isn't always the case with UPCs, so check your product's barcode. To automatically route your ticket to the Retail Imports team, from the Category drop-down, select Import > Customers/Inventory/Vendors.